Our New York adventure continued after the Met with lunch at Uva, an Italian restaurant at 2nd Avenue between E. 77th and 78th Street. There’s a lovely patio with a retractable roof at the back of the restaurant. And here’s my lovely friend, politely posing for yet another photo when I’m sure she’d secretly like to whack me over the head with the menu! After lunch, we made our way to Broadway, where we saw the musical Once. Before the show begins, the audience can go up on stage and order a drink from the bar, which is also the set. The cast performs songs on stage while the audience finds their seats. The talented actors/musicians inject as much life as they can into a rather lugubrious story line and score. What’s particularly impressive is that each cast member not only sings, but also plays one or more of their own instruments, precluding the need for a pit orchestra. Not sure they pulled off the Irish and Czech accents though. To my dismay, I have become one of those people who not only annoys my friends and family by constantly taking pictures of them, but who also takes pictures of my food. Ick. Tomorrow – one more New York post with no food photos. Promise. 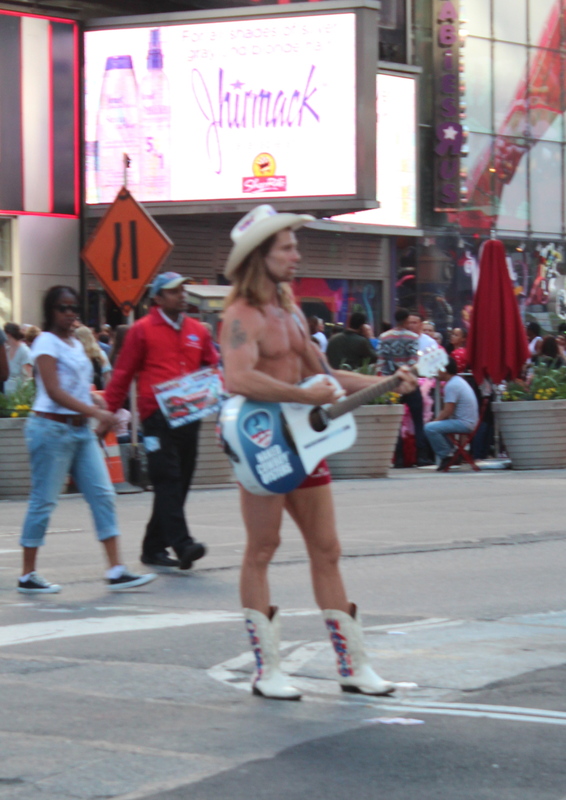 owonderful • This entry was posted in Uncategorized and tagged Má Pêche, Naked Cowboy, New York City, Once, Uva. Bookmark the permalink.